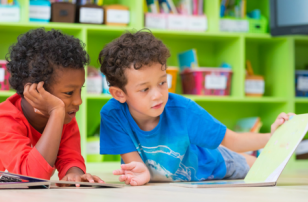 Pretend play activities that combine imaginative play with crafts are our favorite things to do lately. 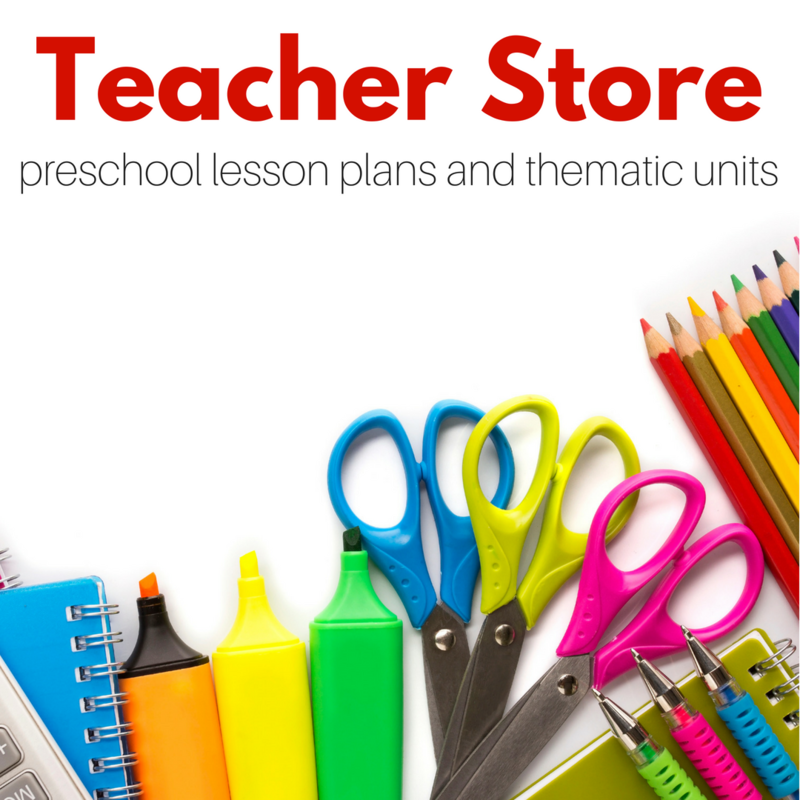 Also our supplies are made up of many recycled and reusable materials. 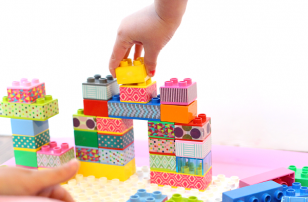 This can be done with boxes, wagons pretty much anything your child can sit in! When they are pretending go along with their suggestions and let them lead. It’s your turn to ask “Why?” and follow along. Most of all have fun. Gather your materials. We are using a laundry basket, some party streamers, a wrapping paper tube, some painters tape, pipe cleaners, a paper grocery bag, sticky back foam, markers and scissors. 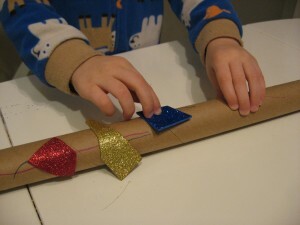 Start by having your child decorate the mast of the sail ( aka the wrapping paper tube) with markers and foam. 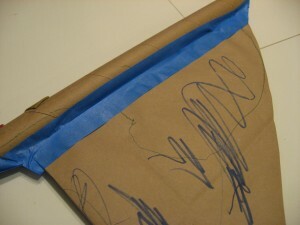 While they are doing that , draw a sail on the inside of the grocery bag. 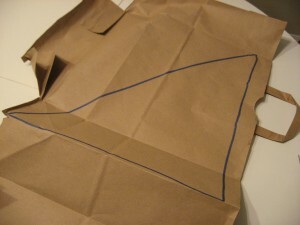 Fold and cut two layers ( so the inside is facing out ) of sail. 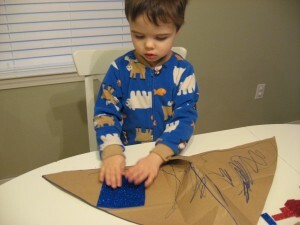 Decorate the sail with markers and foam. Tape the sail to the mast. I am using painters tape because my son likes the blue. Any tape will work. Decorate the boat. 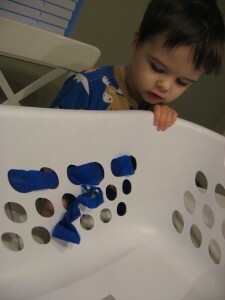 We weaved the party streamers in and out of the little holes on the sides of our basket. 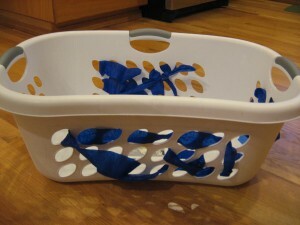 I didn’t want anything sticky in the basket since my laundry does sometimes get put in it. Attach the mast. 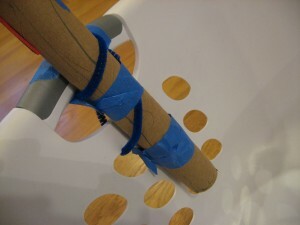 I am using pipe cleaners wrapped around the tube and tied to the basket. Like I said above I didn’t want sticky tape residue on my basket. If you are using a box no biggie but this worked for us. I covered the sharp edges with painters tape which also won’t leave a residue. All Aboard! We played ferry boat, and the drink you see was part of our pretend play. I had to be the lady in the ferry cafeteria and make him a drink before he got back in his Honda and we docked. Hey it got some banana into him too ! Next Post: Valentine’s Day Heart Shaker Craft! My guy plays in the laundry basket too. I think he’d be thrilled if we made a sail and a mast. 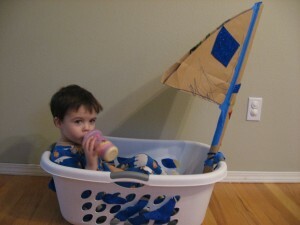 One day we made a pirate flag and attached it to the back of a chair he was using as part of a pretend boat. 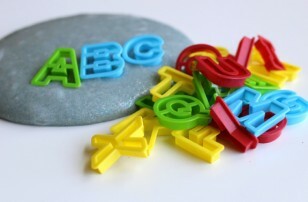 We are going to do the alien name craft from your other blog this weekend. I can’t wait! I don’t think there’s a kid alive who wouldn’t LOVE that!!! .-= katherinemarie´s last blog ..Last peek backâ€¦ =-. I love this. And I’m sure both of my kids, would, too. I must find a suitable mast – hmmmm. .-= Amber´s last blog ..Leashing the Baby =-. When I was a little girl I used to crawl around the garden with my mum’s laundry basket on my back – I was a turtle of course! 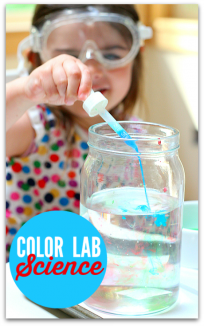 .-= Cathy at nurturestore´s last blog ..Magic sauce recipe â€“ get your kids eating vegetables =-. Great idea! My kids love to make a ‘ship’ or ‘pirate ship’ by stretching a fitted King size sheet across two chairs that are about 3 feet apart from each other. 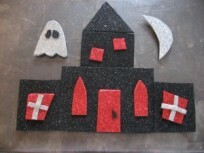 The flag will be a GREAT addition to our imaginative play! My MOPS and MOMS mommies will love this! 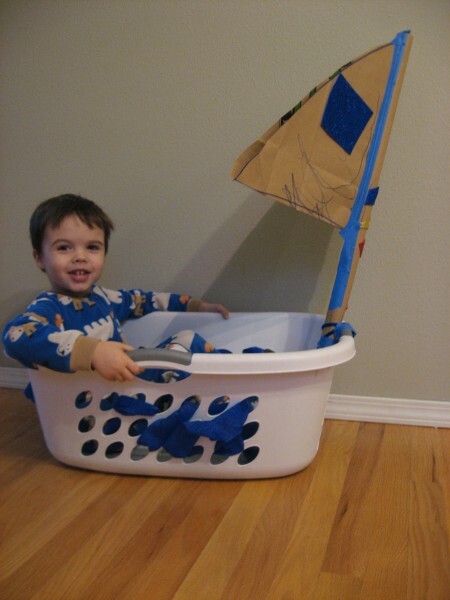 My kids play boat with our laundry basket almost every day! I’ve never thought to actually make a sail. What a fabulous idea! I may do this myself after they go to bed tonight and surprise them tomorrow!! I use to put my little girl in her laudry basket and we would pretend it was a big pot of soup, and we were making “Caroline Soup”. I’d cut up pretend carrots, potatoes… and I’d shake the laundry basket to stir the soup, and pretend to taste it, add a little salt and pepper and she would just laugh and laugh! !